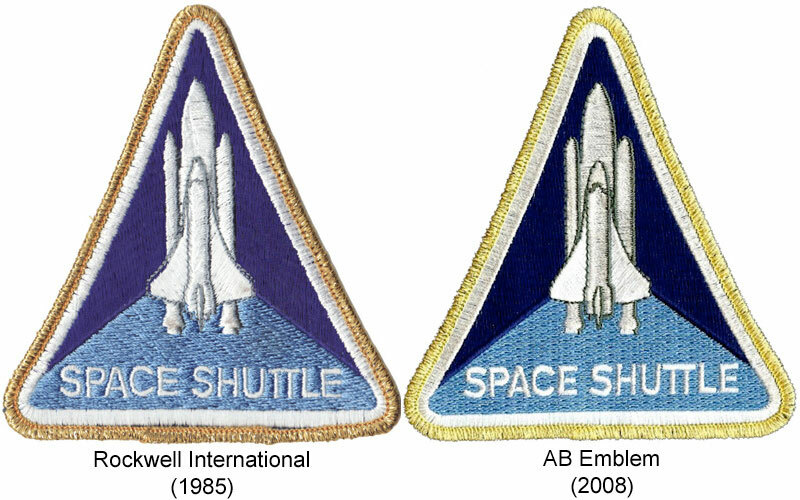 Does anyone out there know if there is a real difference in the Space Shuttle Program patch that NASA astronauts wore on their light blue flight jackets in the early to mid 1980's and the current AB Emblem Space Shuttle program patch? Is the patch that is out now pretty much the same one that was worn by astronauts in the 80's? I have a 3" shuttle program patch that I bought at the now defunct Florence, South Carolina air and space museum way back in 1979 at the young age of 8. This is my first patch ever and I still have it! I am wondering, since I don't remember, if anyone can say who is the manufacturer of this patch pictured below. When was the program insignia first introduced and do we know who designed it? It was designed by artist Robert Schulman, who was head of the Special Services Branch at NASA Headquarters. The design was first released in December 1976. Thanks. I was going to ask next if anyone knew how to contact Schulman, but a quick search resulted in the NASA release noting his death in 2004. Thanks, I thought it might be AB Emblem, but I had to pass it along to more studious people to consider. I still remember the day I got it. I'm sure my parents paid for it considering my age. I will never part with it as it's my most sentimental patch although it is a little worn and slightly tattered looking. I've been noticing several variations to the triangular shuttle program patch. How many have you seen? What is the patches status, are they commemorative, commemorating a specific cause like breast cancer; personal, etc.? Is the triangular patch the official insignia of the shuttle program or is the round Space Shuttle Program insignia the "new official" design, if so when did it change to the round design? I've found the following so far. There's another one I came across a few months back. Standard triangular shape with a really washed out pink as the main color and instead of "Space Shuttle" it has "Endeavour '92". To the best of my knowledge, other than the official gold border version, all the others were fantasy/souvenir patches produced without NASA's or its contractors' knowledge. I could be wrong, though. There is also a version (at least in decal form) that has the gold border but the external tank is the burnt orange of the post-STS-2 missions). That too, is not official (but could be spotted around the ET office at Marshall Space Flight Center). There was also a version kicking around on eBay in the past 6 months that I believe said "Space Shuttle Discovery" but otherwise looked like the regular, 3" version. I believe the decal with the burnt orange external tank may possibly be Lockheed Martin's version of the logo patch to signify their Michoud operations. I recently purchased a logo pin with the orange tank from a former employee's family member, but this is my speculation. 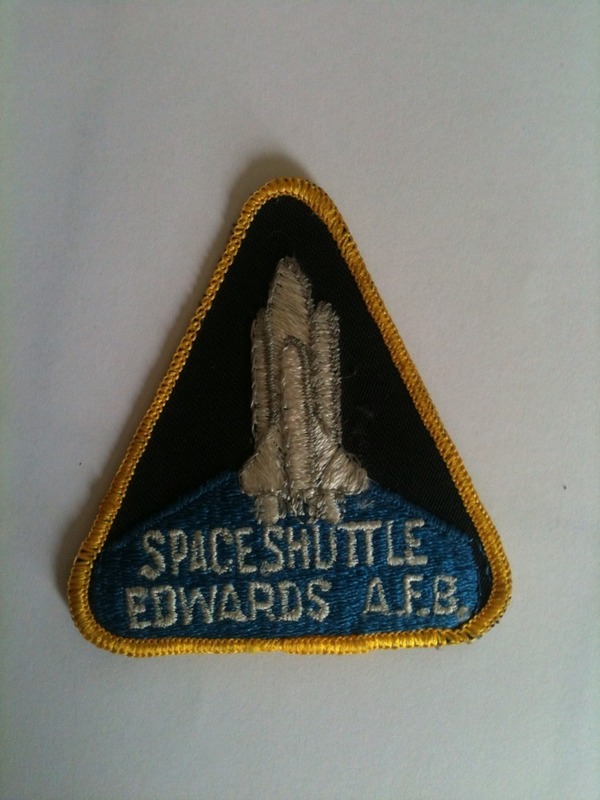 The 3 inch program patches with Edwards AFB or Space Shuttle Discovery were mostly used on hats and sold on the East Shore Public Viewing Site. They were also sold by the same groups again at the Edwards AFB Open Houses in the 80's. They were better for those groups to sell since they would work for a lot of landings and they would not get stuck with hats for one single mission if they had used a crew patch. 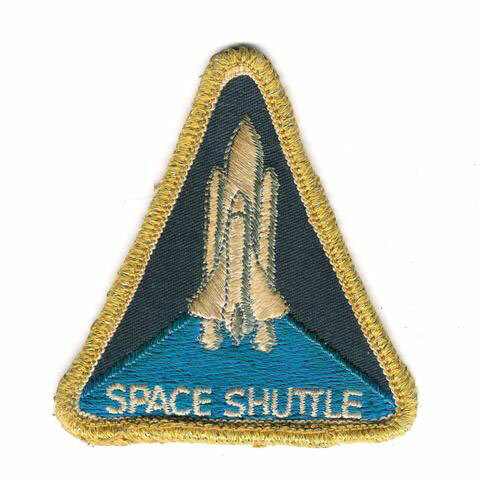 Would anyone know what font was used in the Space Shuttle program patch? It does not seem to be Helvetica Regular. I found this decal on eBay. I haven't seen this variation. Is it a real design update from NASA? Thanks for the merge! My question is answered unless any new information comes to light. The Space Shuttle program logo with brown tank was distributed as a sticker at KSC on the occasion of the final launch, STS-135. ...distributed as a sticker at KSC on the occasion of the final launch, STS-135. Wow. I'd never even heard of that before now. Did Lion Brothers make a Shuttle Program patch (the triangular "Space Shuttle" patch) with a bare cloth backing? I've seen two types of plastic backed program patches by LB, but never a cloth backed type. Does it exist? Yes, they do exist. I have two examples of a bare backed Lion Brothers Shuttle Program patch. (One is attached to a Smithsonian Inst. NASM card). These are rare patches, but they could be normal Lion Brothers patches but with the plastic coating, or vacuum sealed coating missing. Looking for information about the triangular STS Program Patches. Can't seem to find variations (except for Lion Brothers and early AB) anywhere. Maybe I'm missing something on spacepatchdatabase.com or crewpatches.com? Does anybody know the history of the space shuttle program logo? When was it introduced? Was there any guidelines for its official use back in the shuttle days? I may be wrong, but it looks like it was not widely used in the agency, any idea why? As noted previously, it was designed by artist Robert Schulman, who was head of the Special Services Branch at NASA Headquarters. The design was first released in December 1976. Guidelines were released. The original plan was to have all shuttle crews wear this patch, with a red bar below indicating the mission number, instead of a crew patch. As you might expect, the astronauts got that plan scrapped.